Eight to 16 million years ago, highly explosive volcanism occurred in the area of today's Galapagos Islands. This is shown for the first time by analyses of core samples obtained by the Integrated Ocean Drilling Program in the eastern Pacific Ocean. Jointly with colleagues from the US, Taiwan, Australia and Switzerland, volcanologists from the GEOMAR Helmholtz Centre for Ocean Research Kiel now present their results in the international journal Geology. Understanding the volcanic activity on Earth is not only important in order to limit the impact of natural disasters, volcanic eruptions also have a large impact on the climate and evolution of life on our planet. However, many details in the history of volcanic activity are still unknown. Scientists from the GEOMAR Helmholtz Centre for Ocean Research Kiel, together with colleagues from the USA, Taiwan, Australia and Switzerland, now have been able to track the development of the Galapagos volcanoes in the time frame between eight and 16 million years ago. In the process they encountered several surprise findings as they now report in the international journal Geology. 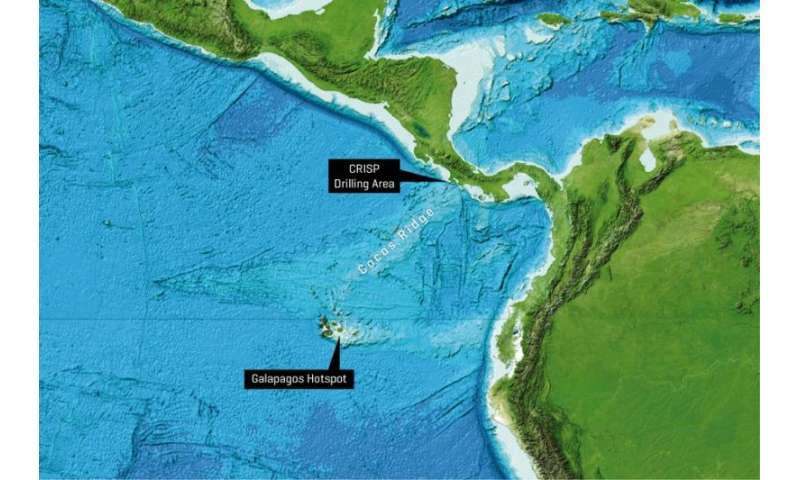 The study is based on several cores from the Cocos Ridge which stretches from the Galapagos Islands to Central America on the seafloor of the eastern Pacific Ocean. In spring 2011 and fall 2012, these cores were obtained about 50 kilometres off the coast of Costa Rica by the scientific drilling ship JOIDES RESOLUTION within the framework of the Integrated Ocean Drilling Program (now International Ocean Discovery Program, IODP). "From the Miocene period alone, i.e. between 16.5 and 8 million years ago, we were able to identify 67 ash layers of volcanic eruptions in these cores," says Dr Julie Schindlbeck from GEOMAR, lead author of the study. Using geochemical and volcanological methods of analysis, the researchers were able to link the ashes to the volcanic Galapagos hotspot 1200 kilometres away. "Today's Galapagos Islands are only about four million years old. The older islands have sunk long before. Therefore traces of eruptions in the Miocene can only be found in the seafloor. To reach them, of course, is very expensive. So this finding was very valuable to us," says co-author Dr Steffen Kutterolf from GEOMAR. Due to the movement of tectonic plates, the distance between the core sites and the Galapagos hotspot during the Miocene, however, was smaller, about 50 to 450 kilometres. But even these lesser distances prove that the eruptions were highly explosive. "They must have been so-called plinian eruptions, otherwise the ashes couldn't have been deposited so far away. Thus, this is the first evidence of such strong volcanic events at the Galapagos hotspot during the Miocene," says Schindlbeck. Another interesting result of the analyses: The activity of the Galapagos hotspot significantly increased about 14 million years ago. "We counted more eruptions after that time. Most likely, the hotspot produced more magma," explains the lead author, "and we suspect that the nearby ridge between the Nazca and the Cocos plate influenced the hotspot." This interaction between hotspot and ridge has already been indicated by earlier studies. The current study also raises new questions. The composition of the analysed ash layers indicates that they were produced by basaltic magmas. This type of magma is characterized by low viscosity. "Volcanoes with basaltic magma form lava flows with regular activity, but major explosions seldom occur, a good example being today's Hawaiian volcanoes," explains Dr Kutterolf. "Now we want to find out why these obviously powerful explosions occurred in spite of these basaltic magmas," adds the volcanologist. In summary, a regional and temporal gap in the global history of volcanic activity could be closed thanks to the new study. 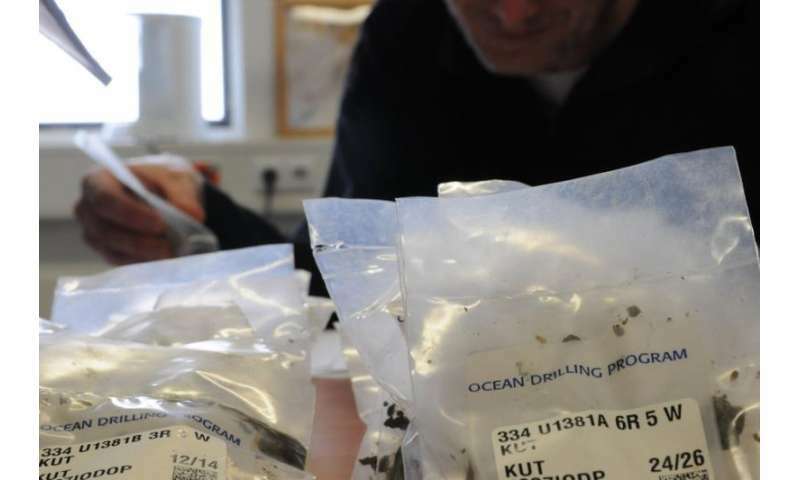 "At the same time, new findings raise new questions," says Dr. Kutterolf, "this is why the scientific deep-sea drilling program IODP is so important. Many open and unresolved questions about the history of our planet can only be answered with samples from the seabed."